A bacterium resistant to all available antibiotics killed a woman from Nevada in January 2017. The incident is a solemn reminder of the desperate need to develop new weapons against superbugs. But one of the solutions might actually lie in a century-old, forgotten therapy. Public health officials have been warning about the looming antibiotics crisis for years. In 2013, over 20,000 annual deaths in the U.S. were attributed to bacterial infections that can’t be treated effectively with antibiotics, according to the Centers for Disease Control and Prevention. Some researchers warn, if nothing changes, 10 million people around the world could die from antibiotic resistant microorganisms in 2050. Dr. Alexander Sulakvelidze has come at the problem from a different direction since the late 1990s. An immigrant from Georgia, he worked as a research fellow at the University of Maryland Medical Center in Baltimore and saw many infection cases that were simply untreatable with antibiotics. “You just see these patients die in the most developed country,” Sulakvelidze says. But the stunning moment did not come to Sulakvelidze until he naively suggested that doctors at the medical center use bacteriophages to treat those patients. Bacteriophages or phages are viruses that slay bacteria in nature. They’re one of the most abundant life forms on this planet, killing one hundred thousand trillion (10^23) bacteria every single second. It turned out Sulakvelidze’s supervisor, Glenn Morris, a leading infectious disease researcher who now directs the Emerging Pathogen Institute at University of Florida, had never heard about treating infections with bacteriophages. Such treatment or bacteriophage therapy was invented in the late 1910s. A French-Canadian microbiologist named Felix d’Herelle first experimented on chicken and then successfully cured the first human patient with the therapy in August 1919. After that, phages became widely used antimicrobials in the U.S. and the Soviet Union until the 1940s — when they lost their place to the miracle drug, penicillin, and other antibiotics. But in Georgia, where Sulakvelidze grew up, doctors have continued to use bacteriophage therapy. Georgian doctors use the therapy to treat everything from urinary tract to wound infections, and one place that the therapy is routinely practiced is the Georgia Eliava Institute of Bacteriophage, Microbiology and Virology in Tbilisi. The Eliava Institute’s clinic usually knocks out bacterial infections in two weeks, either with phages alone or a mix of phages and antibiotics, says director Dr. Mzia Kutateladze. It is a laborious process to keep and raise phages in a petri dish, not to mention to choose and use specific phages for specific bacteria, says Kutateladze. That might be part of the reason why bacteriophage therapy became obscure decades ago. Open to both Georgian patients and international patients, the Eliava Institute had about 15 patients from abroad in January, Kutateladze says. They came from Europe, Canada and the U.S. for bacteriophage therapy. Just like sightings of the Loch Ness Monster or Big Foot, people’s testimonials are far from convincing, says Spellberg. Someone has to provide solid evidence from randomized clinical trials, he says, which are the gold standard for a medical treatment being safe and effective. Dr. Randolph Fish, a wound care physician in Tacoma, WA, agrees on the importance of conducting rigorous clinical trials. Unlike Spellberg, Fish has used bacteriophage therapy in the U.S. He has applied phages to treat the toe ulcers caused by bacteria in a dozen diabetic patients, under compassionate use circumstance. The only other option for those patients is amputation. Preliminary evidence suggests the therapy has some effects: out of the dozen patients Fish treated, nine recovered in a course of two years. The study was published in the Journal of Wound Care last July. Fish uses commercial phage vials from Georgia’s Eliava Institute, and is collecting data to plan for a clinical trial. So far, only a few early stage clinical trials have been performed on bacteriophage therapy. Overall, the results suggest the phages are safe for both healthy volunteers and patients with infection. However, there hasn’t been any trial on efficacy. The progress is slow because pharmaceutical companies have to invest millions of dollars in such trials, which is “gambling” in a sense, says Scott Salka, AmpliPhi Biosciences’s CEO. The San Diego based company is planning the efficacy trials, and it will need to pay $50,000 per patient, Salka explains, which means $5 million for a trial containing 100 patients, 50 treated with phages and 50 with placebo. “But we are expecting returns,” says Salka. One specific application they are looking at is chronic sinus infection, which leads to 40,000 surgeries in the U.S. per year. If their phage products were effective in treating the chronic, recurrent infections, these patients could avoid taking too much antibiotics over time or undergoing surgeries to cut out the infectious tissue. Sulakvelidze has his own phage company, Intralytix, which has been testing phage’s safety in patients as well, but its main products so far are in the area of food safety. “You can simply apply phages onto the unprocessed food, and it’s very natural and very effective,” says Sulakvelidze. Their FDA approved phages are sprayed on seafood to kill bacteria. Once the targeted bacteria are killed, the phages that feed on these bacteria will die off as well, Sulakvelidze explains. When I mentioned that one of my friends was disgusted by this idea, Tacoma’s Fish said, “Your friend is literally covered with those viruses (phages). And those viruses are probably the reason that you and I and your friend are alive today because they are keeping down the population of bacteria that will kill us.” And it is a fact that on this planet, 10^31 phages co-exist with us humans. For both Salka and Sulakvelidze, the selectivity of phages is a big advantage over antibiotics. Salka gives an example of how the current antibiotic treatment can be problematic. In elderly patients who have weak immune systems, aggressive use of antibiotics can kill too much of their microbiome, says Salka. Then their gut would become “a warm, nice garden” for superbugs in the hospitals to sneak in. Timothy Lu, a professor at MIT who engineers phages to target superbugs in the lab setting, agrees that phages are very specific, but that can also pose a hurdle for any bacteriophage therapy. “We need better diagnostic tools to figure out what bacteria is causing the disease [to see] what phages we might be able to use,” Lu says. If doctors don’t know the specific type of bacteria, they are not going to select the right bacteriophages for treatment. To detect and identify disease-causing bacteria, Lu is developing phage-based diagnostic tools in collaboration with a biotech company, and others have been working on better diagnosis technology too. The most recent progress came from Feng Zhang’s team at MIT who published a study in April about a CRISPR-based platform that could detect a range of infectious agents. CRISPR is originally part of bacteria’s defense mechanisms and has been used as a gene editing tool. The way that bacteriophages kill bacteria is a true wonder of nature. The story starts when a phage first attaches to a bacterium. The phage, which looks like mini-spaceship under a microscope, with a hexagonal body and landing claws, can only attach to a bacterium with specific protein features on its cell wall. That’s why researchers who work with these bacteria-eaters usually make a cocktail of three to five phages that can recognize different features of the same bacterium, so that even if the target bacterium escaped one phage there would be another one in the cocktail to catch it. After attaching to the host bacterium, the phage injects its DNA material into the bacterial cell, hijacking its cellular machinery to make new phages instead of new bacteria. And the final step is to blow up the host bacterium from the inside, says Eric Keen, a graduate student at Washington University in St. Louis, who studies bacteriophages. 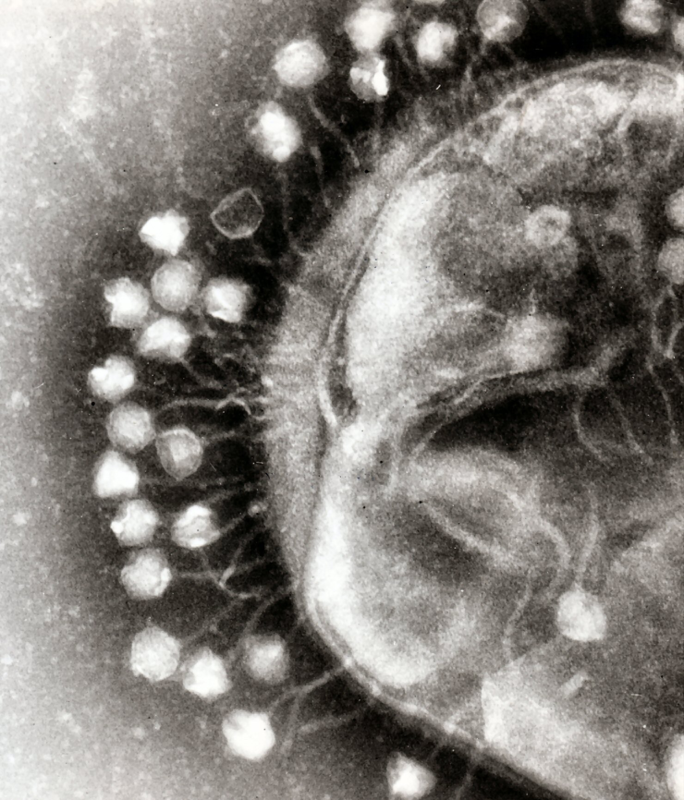 As the phage produces an enzyme that breaks the cell wall of the bacterium, the next generation of phages are set free to infect more nearby bacteria. But the dead bacterium doesn’t stop making trouble. As the bacterium bursts, it might also release fragments of bacterial DNA, or plasmids, that can jump between bacteria and spread antibiotic resistance genes along with them. And there are actually phages that could accelerate this spread of antibiotic resistance. Keen and colleagues recently identified two “superspreader” phages in the soil of South Florida that release these bacterial plasmids more efficiently. As bacteriophage therapy progresses, Keen says, it’s important to characterize phages beforehand and avoid any superspreaders. Regulatory hurdles are another challenge. “Phages are much more complex products than the small molecule antibiotics,” says Lu. “Phages on their own are a tool, and just like many other things, you have to apply them the right way,” he says. Lu suggests that in future, the FDA might want to consider treating phages like the flu vaccine, because researchers can “mix and match” the phages with bacteria and let them co-evolve to treat new superbugs — a clinical advantage, but also a regulatory complexity. “Will [the FDA] allow phages to be like that? I think that will be very useful, but right now I don’t think anyone really knows the answer,” says Lu. Speaking of future applications, Keen says bacteriophage therapy would be more heavily used for chronic infections and surface infections that are easily reachable. One of the ongoing trials focuses on the chronic infections of burn victims in France, he says, which is a good example of the type of infections that would be amenable to bacteriophage therapy. Lu is optimistic about the progress of bacteriophage therapy. “It’s feasible that within three to five years you might start to see some of these enhanced therapies being tested,” he says. And targeted killing of bacteria is the future, researchers like Keen and Lu say. We really need to be more selective about “killing the bad bacteria while sparing the good bacteria,” Lu says. It took us 50 years to understand there are actually good bacteria that’s essential to our health. Nobody knows how many years the mainstream medical world will have to wait for this forgotten therapy. But this time at least proponents don’t have to start from zero as Sulakvelidze did 20 years ago.